The top of Pendle Hill is about as close to Heaven as you can get in the Pennines.To be stood there at 6.30am in full sunshine, white frost and no wind with a Dotterel only fifteen feet in front of you is truly a magical experience. On the 2nd of May I trekked to the top of Pendle `hill and had an undisturbed two hours with a Dotterel that eventually was so tame it fed within five feet of my foot. 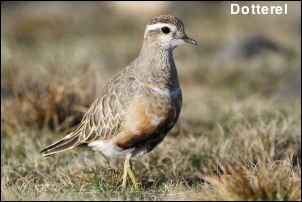 It was to get even better for at 7.15am the Dotterel cocked its head to one side and gave three piping calls. Out of the sky another Dotterel landed fifteen feet away and commenced feeding – this was migration at its best and an experience I have never witnessed before. Eventually I left the top of Pendle HIll at 9am on a high and with nearly two hundred quality photos in the camera. Some of these can be seen on my facebook including one where the Dotterel was calling the other bird out of the sky. The rest of the week has been spent searching for Woodcock but as usual none have been seen. On Hopwood Buzzard and Sparrowhawk were competing for a nest site with the expectation that the Buzzard will win. Linnets were active amongst the gorse and last years Green Woodpecker’s hole has been plastered up by a pair of nesting Nuthatches. With the welcoming warm weather butterflies have made an appearance. Many Small Tortoiseshells are on the wing plus Orange Tips, Green Veined and even a Peacock butterfly on the top of Pendle Hill.